Twitter has launched a brand new official app for Android tablets, but as of right now only a owners of one Google-powered/Samsung-built slate will have the opportunity to jump on board. The new app, which features a new landscape view UI that showcases tweets, conversations, trends, interesting accounts and more, is available exclusively for the Samsung Galaxy Note 10.1 (2014). It will land on other Samsung tablets in due course, before a wider roll to other unspecified Android devices by the end of the year. 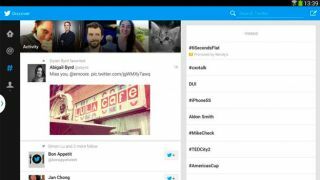 Twitter brags that its first app optimised for Android tablets "fills your screen with Tweets, conversations, Trends, accounts to follow and more." In a post on its official blog, the company explained: "With a single tap, Tweets expand on the right side to show photos, videos and article previews. Dive deeper with another tap to see photos, play videos or read links from the web in fullscreen mode." That Samsung exclusivity does bring some unique features for Note 10.1 owners. Samsung's Multi Window software feature allows Twitter and other apps to run in dual screen mode, while tweets and photos can also be annotated using the S Pen stylus. There's also a new widget that'll deliver region specific breaking news, to the tablet's homescreen, while enabling users to reply, favourite and retweet without entering the app itself. Twitter has offered no specifics on the next Android devices to benefit from the app, so unless you've snagged the latest Note 10.1 device, you're bang out of luck for the foreseeable. Opinion: Why Twitter tuning into TV makes us all want to tune out.